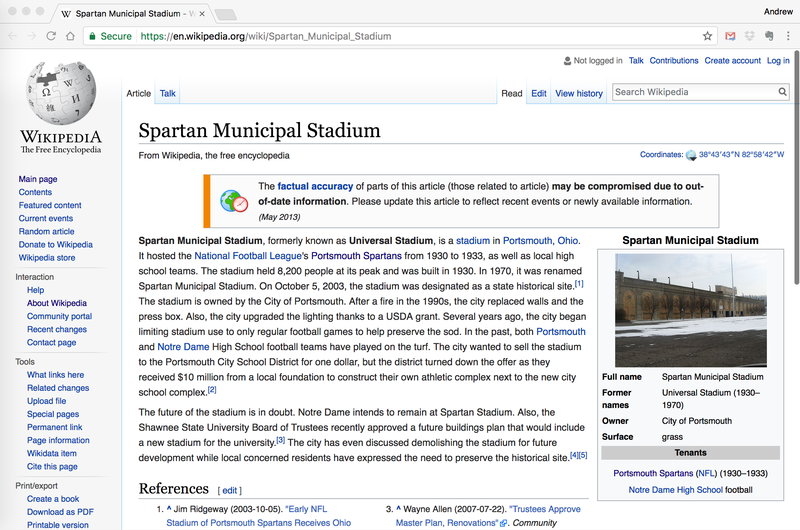 Screenshot of the Wikipedia entry for "Spartan Municipal Stadium," as updated to March 5th, 2017. The stadium's history is intertwined with that of the early National Football League, which the Portsmouth Spartans joined in the fall of 1930. For three years the stadium hosted professional teams from across the nation, including the Chicago Bears, the Green Bay Packers, and the Brooklyn Dodgers. In the spring of 2017, as part of the content upgrade for Scioto Historical 2.0, students at Shawnee State University began studying the history of the stadium and documenting how its entry in Wikipedia changes over time. This image from March 5th, 2017, inaugurates the series of screenshots, which will be collected annually every spring.